Yesterday was some planned maintenance work at our prairie research site. The weather was just right for field work: hot and humid, sweltering, a word based on the root "swell". It was a pretty simple job: find our research plots marked on their SW corner with white pvc pipe standing about 30" tall and stick in it a 5-6' bamboo stake with bright pink flagging on the upper end so we can find the plots later in the year. In the late spring the poles seem quite absurd in their conspicuousness, but later in the season that changes even when the plot is covered with black 50% shade cloth. See the difference from May to August? In this case the treatment, removal of a hemiparasitic plant plus added fertilizer is having an effect (very positive on grasses). Actually the late season plot isn't marked with a tall pole because this isn't one of the plots that's hard to find. Usually they are marked in early June, and by now it would be a problem with the vegetation at 5-6 feet tall. But this year because of the draught only a few species were standing above 4 feet tall (compass plant, big blue stem, tall coreopsis). 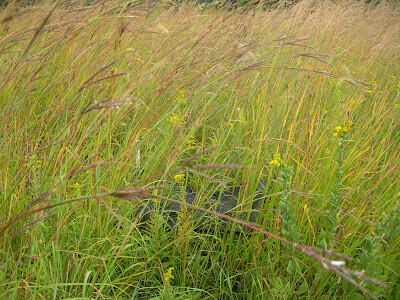 Most of the prairie species looked fine, just shorter, and the flowering was mostly on schedule. 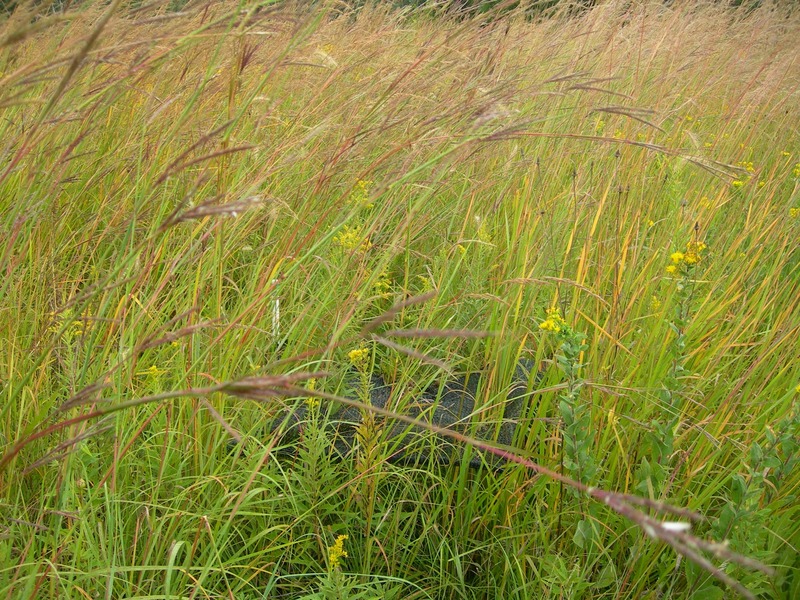 Unfortunately for the researchers, it isn't so much how tall the prairie is, but how dense the vegetation is, and it was dense, so it was hard to find our pvc pipes anyways, especially the one that was lying on the ground. You see these research plots are not on some nice neat grid, but scattered around, and even after you sort of become familiar with the pattern, they can be hard to locate in the tall, dense vegetation.